Shouldn't it be a national holiday? Sorry, "Weiner Stampede" fans. Heinz Ketchup, makers of last year's much-loved, dachshund-filled Super Bowl commercial, is sitting out this year's game. But it's not completely disconnecting from Super Bowl weekend. The brand today launches a grassroots campaign to get the Monday after the Super Bowl—when everyone is a bit cranky, or even calling in sick to work, after a night of partying—to be declared a national holiday. The brand has started an official Change.org petition to "make Monday more like Sunday." The new holiday, Heinz says, should be "Smunday." This isn't the first time a brand has proposed this. Coke Zero did the same thing in 2012. 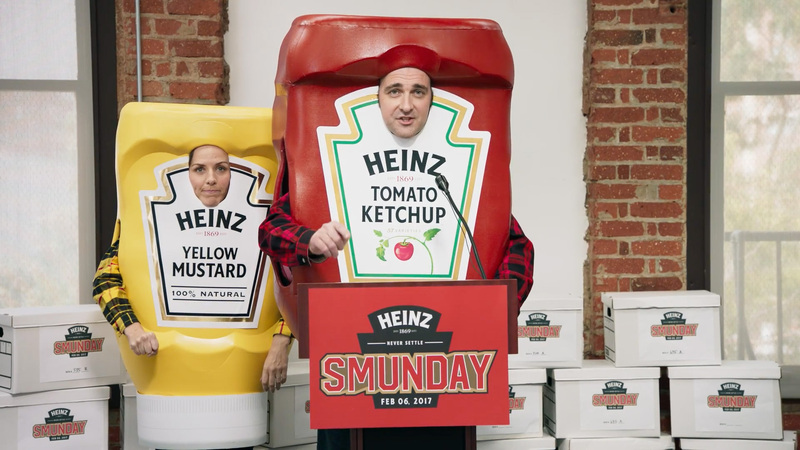 "The inspiration came from a conversation people have been having for years," Nicole Kulwicki, head of the Heinz brand, admits to Adweek. "Here at Heinz, we are all about never settling when it comes to taste or quality of condiments, and never settling when it comes to the day after one of the best sports days of the year." Yes, a push for a national holiday the day after the Super Bowl is goofy and tongue-in-cheek. But Kulwicki says the brand is committed to trying to make it happen. The goal is to get 100,000 signatures on the petition. "That's how many we think we need to get Congress to take us seriously," she says. "We're doing this in good fun, but with the intent that it will actually become a national holiday." To signal the company's commitment to the cause, all employees at Kraft Heinz offices in the U.S. will be given Feb. 6 off this year. "Wiener Stampede," by David Miami, was the No. 2 spot on 2016's USA Today Ad Meter. But despite that success, Kulwicki says the brand wanted to go in a different direction. "We loved 'Wiener Stampede' as well," she says. "It was a great way for us to introduce the full Heinz Ketchup family. This year we're doing something different. We're always looking for ways to connect with our consumers. This is a cause that we felt that the American public feels strongly about. And we really wanted to rally behind that effort." The video above will be shared digitally; there is no TV buy. The campaign was created by agencies David Miami, Starcom, PureRED | Ferrara and Alison Brod Marketing + Communications. For more Super Bowl LI news, check out Adweek's Super Bowl Ad Tracker, an up-to-date list of the brands running Super Bowl spots and the agencies involved in creating them.